The Harvest for All Most Innovative Award is given annually to Young Farmer Programs with a Harvest for All project that is new, unique, impactful, productive and can be easily replicated in other states seeking to have a greater impact on hunger relief in their communities. 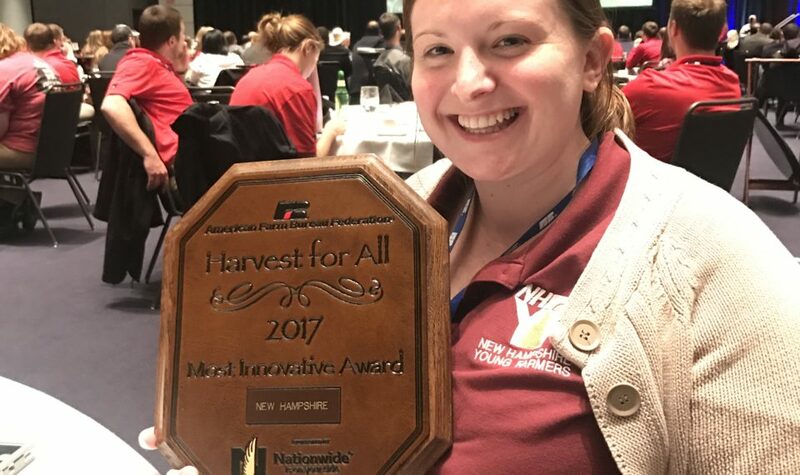 The NHFB Young Farmers were one of three states to be recognized in 2017. 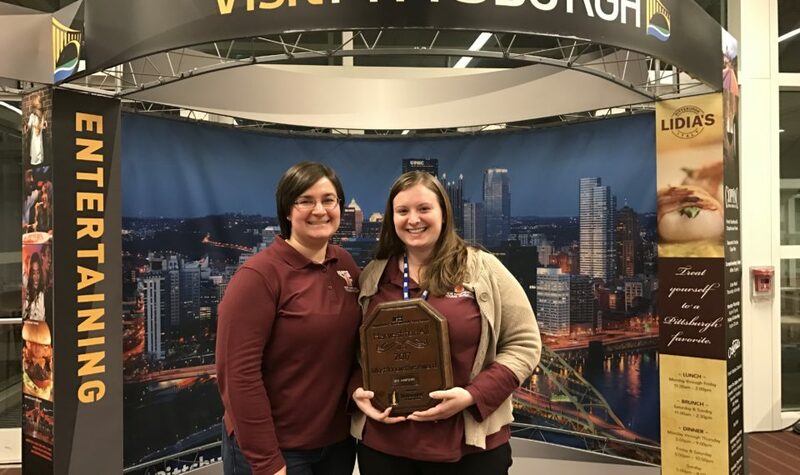 NHFB Young Farmer Coordinator Leandra Pritchard (left) and Young Farmer Committee Chair Amy Matarozzo pose for a picture in Pittsburgh, PA at the 2017 AFBF FUSION Conference. 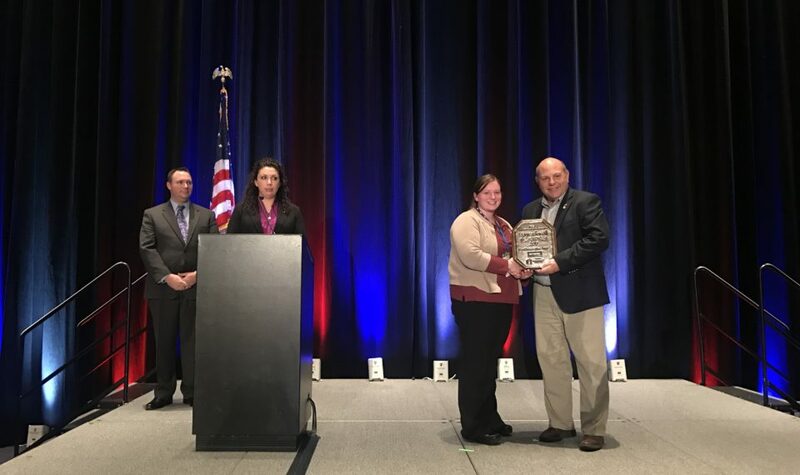 Past New Hampshire Farm Bureau Federation Young Farmer Committee Chair, Amy Matarozzo accepts the 2017 Harvest For All Most Innovative Award from American Farm Bureau Federation President Zippy Duvall Zippy Duvall at the 2017 AFBF FUSION Conference in Pittsburgh, PA.
NHFB Young Farmer Committee Chair Amy Matarozzo after accepting the 2017 Harvest for All Most Innovative award on behalf of the NHFB Young Farmers. 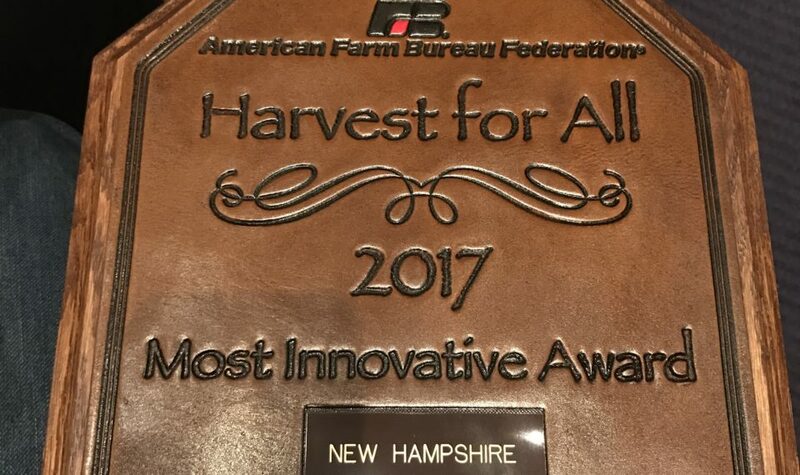 Concord, NH February 14, 2017 – The New Hampshire Farm Bureau Federation Young Farmers were recognized by the American Farm Bureau Federation with the 2017 Harvest For All Most Innovative Award at the 2017 AFBF FUSION Conference in Pittsburgh, Pennsylvania. The award is given annually to Young Farmer Programs with a Harvest for All project that is new, unique, impactful, productive and can be easily replicated in other states seeking to have a greater impact on hunger relief in their communities. With support from Nationwide Insurance, the award also provides funds for future Harvest For All projects. 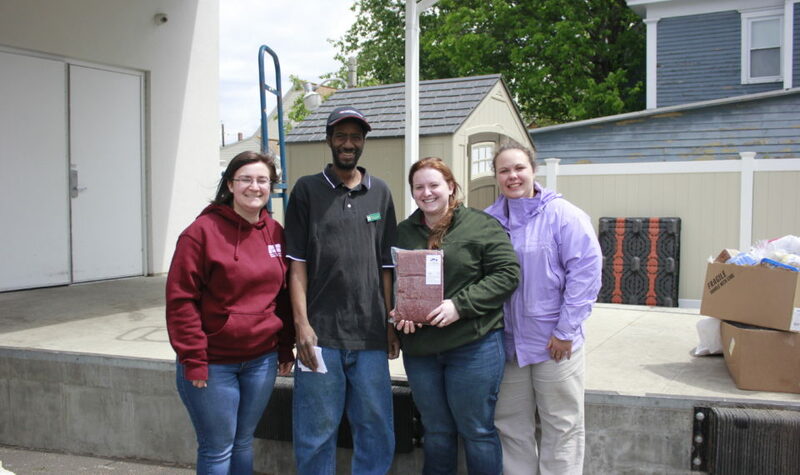 In 2016, the NHFB Young Farmers donated 300 pounds of fresh ground beef to five New Hampshire food pantries & soup kitchens as part of the Harvest For All campaign. The Angus-Holstein calf was donated by Hatchland Farm in North Haverhill and raised by NHFB Young Farmer Chair, Amy Matarozzo, and her husband Brian at their farm, LorrenJoyce Farm, in Center Barnstead for a full year. Donations to the project included feed from Poulin Grain and Feed Commodities International, butchering and processing from The Local Butcher in Center Barnstead, and monetary donations as well as over 200 hours of volunteer time from NHFB Young Farmers. Ground beef is a valuable and unique donation for most soup kitchens. 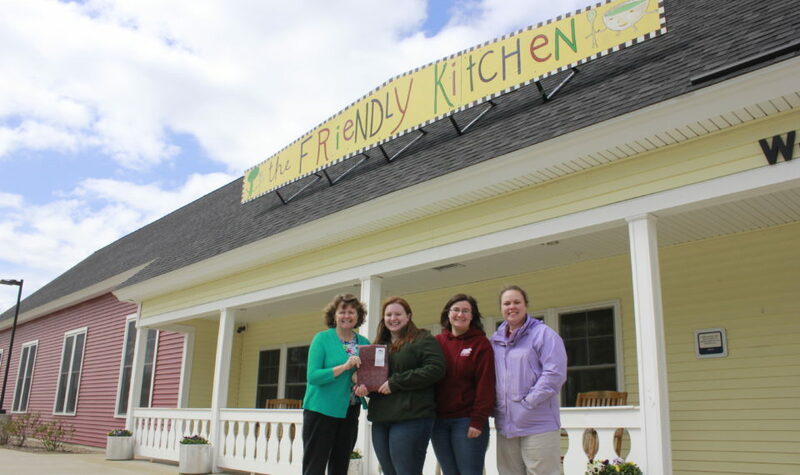 “Ground beef is like gold here,” said Jennifer Lombardo, Director of The Friendly Kitchen in Concord, in a note thanking the Young Farmers for their donation. In addition to the beef donation project, the NHFB Young Farmers also organized the collection and donation of fresh produce to the New Hampshire Food Bank from local farms as part of their Harvest For All efforts. All told, they were able to provide over 8,000 pounds of meat and produce to help fight hunger in the Granite State in 2016. The Harvest For All campaign is a partnership between American Farm Bureau’s Young Farmers and Ranchers Program and Feeding America, a nationwide network of food banks. Statistics show that one in nine individuals in New Hampshire are food insecure, meaning they live in risk of hunger. To find out how you can help the NHFB Young Farmers with future Harvest For All projects or to learn more about the NHFB Young Farmers you can call the New Hampshire Farm Bureau Office at 603-224-1934, visit www.nhfarmbureau.org, or e-mail editor@nhfarmbureau.org. This entry was posted in Press Release and tagged Agriculture in New Hampshire, American Farm Bureau, Farm Bureau, Feeding America, Food Bank, Harvest for All, Most Innovative, NH agriculture, NH Farm Bureau, NH Young Farmers on February 14, 2017 by Josh Marshall - NHFBF Communications Director.